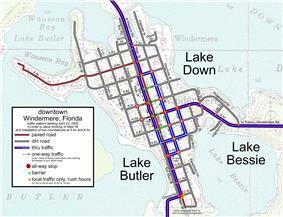 A simple grid plan road map (Windermere, Florida). Hammurabi (17th century BC) was a king of the Babylonian Empire who made Babylon one of the greatest cities in antiquity. He rebuilt Babylon, building and restoring temples, city walls and public buildings, and building canals for irrigation. The streets of Babylon were wide and straight, intersected approximately at right angles, and were paved with bricks and bitumen. Teotihuacan, near modern-day Mexico City, is the largest ancient grid-plan site in the Americas. 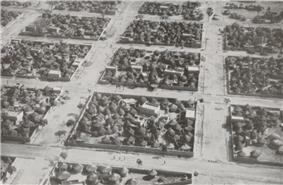 The city's grid covered eight square miles. Although the idea of the grid was present in Hellenic societal and city planning, it was not pervasive prior to the 5th century BC. However, it slowly gained primacy through the work of Hippodamus of Miletus, who planned and replanned many Greek cities in accordance with this form. The concept of a grid as the ideal method of town planning had become widely accepted by the time of Alexander the Great. His conquests were a step in the propagation of the grid plan throughout colonies, some as far-flung as Taxila in Pakistan, that would later be mirrored by the expansion of the Roman Empire. The Greek grid had its streets aligned roughly in relation to the cardinal points and generally looked to take advantage of visual cues based on the hilly landscape typical of Greece and Asia Minor. This was probably best exemplified in Priene, in present-day western Turkey, where the orthogonal city grid was based on the cardinal points, on sloping terrain that struck views out towards a river and the city of Miletus. The Etruscan people, whose territories in Italy encompassed what would eventually become Rome (Rix cited in Woodward 2008), founded what is now the city of Marzabotto at the end of the 6th century BC. It was based on Greek Ionic ideas, and it was here that the main east-west and north-south axes of a town (the decumanus maximus and cardo maximus respectively) could first be seen in Italy. According to Stanislawski, there is little evidence that the Romans adopted the Etruscan model at Marzabatto early in their expansion. Instead, the Roman Grid was spread around the Mediterranean and into northern Europe later on, during the late Republic and early Empire. The military expansion of this period facilitated the adoption of the grid form as standard: the Romans established castra (forts or camps) first as military centres; some of them developed into administrative hubs. The Roman grid was similar in form to the Greek version of a grid, but allowed for practical considerations. For example, Roman castra were often sited on flat land, especially close to or on important nodes like river crossings or intersections of trade routes. The dimensions of the castra were often standard, with each of its four walls generally having a length of 2,150 feet (660 metres). Familiarity was the aim of such standardisation: soldiers could be stationed anywhere around the Empire, and orientation would be easy within established towns if they had a standard layout. Each would have the aforementioned decumanus maximus and cardo maximus at its heart, and their intersection would form the forum, around which would be sited important public buildings. Indeed, such was the degree of similarity between towns that Higgins states that soldiers "would be housed at the same address as they moved from castra to castra". Pompeii has been cited by both Higgins and Laurence as the best preserved example of the Roman grid. Outside of the castra, large tracts of land were also divided in accordance with the grid within the walls. These were typically 2,400 feet (730 metres) per side (called centuria), and contained 100 parcels of land (each called heredium). 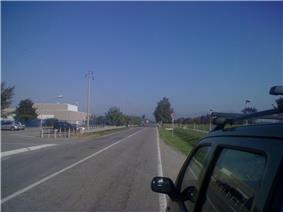 The decumanus maximus and cardo maximus extended from the town gates out towards neighbouring settlements. These were lined up to be as straight as possible, only deviating from their path due to natural obstacles that prevented a direct route. New European towns were planned using grids beginning in the 12th century, most prodigiously in the bastides of southern France that were built during the 13th and 14th centuries. Medieval European new towns using grid plans were widespread, ranging from Wales to the Florentine region. Many were built on ancient grids originally established as Roman colonial outposts. The grid plan became popular with the start of the Renaissance in Northern Europe. In 1606, the newly founded city of Mannheim in Germany was the first Renaissance city laid out on the grid plan. Later came the New Town in Edinburgh and almost the entire city centre of Glasgow, and many planned communities and cities in Australia, Canada and the United States such as New Haven and Adelaide. Many of the earliest cities in the United States, such as Boston, did not start with a grid system. However, even in pre-revolutionary days some cities saw the benefits of such a layout. New Haven Colony, one of the earliest colonies in America, was designed with a tiny 9-square grid at its founding in 1638. On a grander scale, Philadelphia was designed on a rectilinear street grid in 1682: one of the first cities in North America to use a grid system. At the urging of city founder William Penn, surveyor Thomas Holme designed a system of wide streets intersecting at right angles between the Schuylkill River to the west and the Delaware River to the east, including five squares of dedicated parkland. Penn advertised this orderly design as a safeguard against overcrowding, fire, and disease, which plagued European cities. Holme drafted an ideal version of the grid, but alleyways sprouted within and between larger blocks as the city took shape. 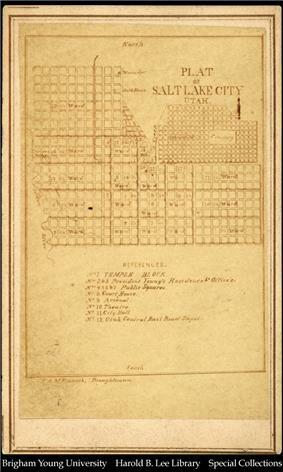 Arguably the most famous grid plan in history is the plan for New York City formulated in the Commissioners' Plan of 1811, a visionary proposal by the state legislature of New York for the development of most of Manhattan above Houston Street. Often, some of the streets in a grid are numbered (First, Second, etc. ), lettered, or arranged in alphabetical order. Downtown San Diego uses all three schemes: north-south streets are numbered from west to east, and east-west streets are split between a lettered series running southward from A through L and a series of streets named after trees or plants, running northward alphabetically from Ash to Walnut. As in many cities, some of these streets have been given new names violating the system (the former D Street is now Broadway, the former 12th Avenue is now Park Boulevard, etc. 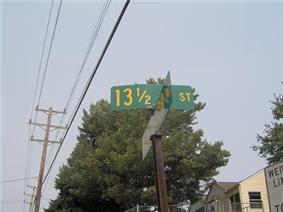 ); this has meant that 2nd, not 1st, is the most common street name in the United States. An exception to the typical, uniform grid is the plan of Oglethorpe Plan. 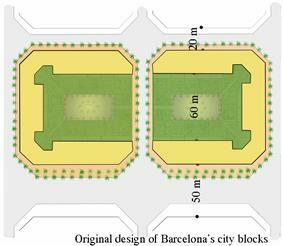 It is a composite, cellular city block consisting of four large corner blocks, four small blocks in between and a public square in the centre; the entire composition of approximately ten acres (four hectares) is known as a ward. Its cellular structure includes all the primary land uses of a neighborhood and has for that reason been called fractal. Its street configuration presages modern traffic calming techniques applied to uniform grids where certain selected streets become discontinuous or narrow, thus discouraging through traffic. The configuration also represents an example of functional shared space, where pedestrian and vehicular traffic can safely and comfortably coexist. One of the main advantages of the grid plan was that it allowed the rapid oxcart at the new site. Apart from the speed of surveying advantage, the rationale at the time of the grid's adoption in this and other cities remains obscure. 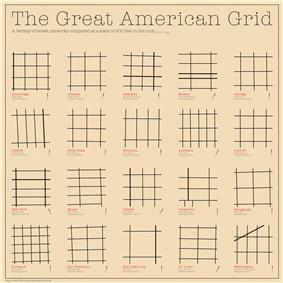 In the United States, the grid system was widely used in most major cities and their suburbs until the 1960s. However, during the 1920s, the rapid adoption of the automobile caused a panic among urban planners, who, based on observation, claimed that speeding cars would eventually kill tens of thousands of small children per year. Apparently, at this early stage of the car's entry into the grid, the streets of major cities worldwide were the scene of virtual "slaughter" as the fatality rate in proportion to population was more than double the current rate. In 2009, after several decades of road safety improvements and a continuous decline in fatalities, an estimated 33,963 people died in motor vehicle traffic crashes and, according to the National Highway Traffic Safety Administration, "Motor vehicle crashes are the leading cause of death for children from 3 to 14 years old.". Planners, therefore, called for an inwardly focused "superblock" arrangement that minimized through automobile traffic and discouraged cars from traveling on anything but arterial roads; traffic generators, such as apartment complexes and shops, would be restricted to the edges of the superblock, along the arterial. This paradigm prevailed between about 1930 and 1960, especially in Los Angeles, where notable examples include Leimert Park (an early example) and Panorama City (a late-period one). One famous grid system is in the British new town of block width and pavement width. Street width, or right of way (ROW), influences the amount of land that is devoted to streets, which becomes unavailable for development and therefore represents an opportunity cost. The wider the street the higher the opportunity cost. Street width is determined by circulation and aesthetic considerations and is not dependent on the pattern configuration. Any configuration can have wide or narrow streets. Traditional orthogonal grid patterns generally have greater street frequencies than discontinuous patterns. For example, Portland's block is 200 feet × 200 feet while Miletus' is half that size and Timgad's half again (see diagram). Houston, Sacramento and Barcelona are progressively bigger reaching up to four times the area of Portland's block. New York's 1811 plan (see above) has blocks of 200 ft. in width and variable lengths ranging from about 500 to 900 feet. The corresponding frequency of streets for each of these block sizes affects the street length. A simple example of a grid street pattern (see diagram) illustrates the progressive reduction in total street length (the sum of all individual street lengths) and the corresponding increase in block length. For a corresponding reduction of one, two, three and four streets within this 40-acre (16 ha) parcel, the street length is reduced from an original total of 12,600 to 7,680 linear feet, a 39% reduction. Simultaneously, block lengths increase from 200 × 200 feet to 1240 × 200 feet. When all five blocks have reached the ultimate size of 1240 feet, four street lengths out of total eight have been eliminated. Block lengths of 1000 feet or larger rarely appear in grid plans and are not recommended as they hinder pedestrian movement (Pedestrianism, below). From the pedestrian perspective, the smaller the block is, the easier the navigation and the more direct the route. Consequently, the finer grids are preferred. Typical uniform grids are unresponsive to topography. Priene's plan, for example, is set on a hill side and most of its north-south streets are stepped, a feature that would have made them inaccessible to carts, chariots and loaded animals. Many modern cities follow Priene's example, e.g. San Francisco, Vancouver, and Saint John, New Brunswick. In a modern context, steep grades limit accessibility by car, and more so by bicycle, on foot, or wheelchair, particularly in cold climates. 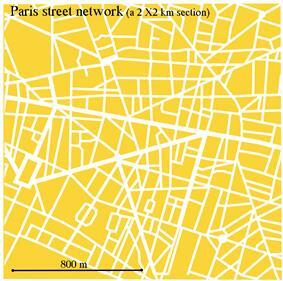 A street network pattern can affect the production of pollutants by the amount of car travel that it necessitates and the speed at which cars can travel. The grid plan with its frequent intersections may displace a portion of the local car trips with walking or biking due to the directness of route that it offers to pedestrians. But it also makes the same routes more direct for cars, which could be an enticement for driving. The potential car trip displacement would result in a reduction of pollutant emissions. The advantage of the intersection density for pedestrians, however, can have a contrary effect for cars due to its potential for reducing speeds. Low speeds below 20 mph have a significantly higher coefficient of pollutant production than above 30, though the coefficient after levelling off tends to increase gradually after 50 mph. This effect is accentuated with high traffic density in areas with commercial uses where speeds come to a crawl. Since the grid plan is non-hierarchical and intersections are frequent, all streets can be subject to this potential reduction of average speeds, leading to a high production of pollutants. Greenhouse and noxious gases can be detrimental to the environment and to resident health. The question of neighbourhood security has been a constant focus of research since Oscar Newman's work. New research has expanded the discussion on this disputed issue. A recent study did extensive spatial analysis and correlated several building, site plan and social factors with crime frequencies and identified subtle nuances to the contrasting positions. The study looked at, among others, dwelling types, unit density (site density) movement on the street, culs–de-sac or grids and the permeability of a residential area. Among its conclusions are, respectively, that flats are always safer than houses and the wealth of inhabitants matters, density is generally beneficial but more so at ground level, local movement is beneficial, but not larger scale movement, relative affluence and the number of neighbours have a greater effect than either being on a cul-de-sac or being on a through street. It also re-established that simple, linear culs-de-sac with good numbers of dwellings that are joined to through streets tend to be safe. As for permeability, it suggests that residential areas should be permeable enough to allow movement in all directions but no more. The overprovision of poorly used permeability is a crime hazard. The open, uniform grid could be seen as an example of undifferentiated permeability. Two inherent characteristics of the grid plan, frequent intersections and orthogonal geometry, assist cul-de-sacs frustrate the traveler especially when they are long, forcing an arduous retracing of steps. Frequency of intersections, however, becomes also a disadvantage for pedestrians and bicycles. It disrupts the relaxed canter of walking and forces pedestrians repeatedly onto the road, a hostile, anxiety-generating territory. People with physical limitations or frailties, children and seniors for example, can find such walk challenging. For bicycles this disadvantage is accentuated as their normal speed is at least double that of pedestrians. Frequent stops negate the speed advantage and the physical benefit of bicycling and add to frustration. Intersections are not only unpleasant but also dangerous. Most traffic collisions and injuries occur at intersections and the majority of the injuries to pedestrians crossing with the right of way. An earlier study found significant differences in recorded accidents between residential neighbourhoods that were laid out on a grid and those that included culs-de-sac and crescents. The frequency of accidents was significantly higher in the grid neighbourhoods. One of the greatest difficulties with grid plans is their lack of specialisation, most of the important amenities being concentrated along the city's main arteries. 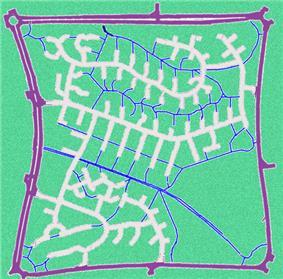 Often grid plans are found in linear settlements, with a main street connecting between the perpendicular roads. However, this can be mitigated by allowing mixed use development so that destinations become closer to home. Many cities, especially in Latin America, still successfully retain their grid plans. Recently, planners in the United States and Canada have revisited the idea of reintroducing grid patterns to many cities and towns. House numbering can be tailored to the grid. ^ a b c d Stanislawski, Dan (1946). "The Grid-Pattern Town", Geog. Rev., xxxvi, pp. 105-120, p. 116. ^ a b c Burns, Ross (2005), Damascus: A History, Routledge, p. 39. ^ a b c d Higgins, Hannah (2009), The Grid Book, p. 60. ^ Woodard, Roger (2008), The ancient languages of Europe. ^ Mumford, Lewis. 1961. The City in History: Its Origins, Its Transformation, and Its Prospects. New York, New York: Harcourt Brace Jovanovich, p.425.